So I recently completed the next large scale piece I wanted to do, called Binary Fracture. Let’s see how it was made! So for this piece I wanted to do something that was hidden. Almost like one of those magic eye posters where you have to go kind of cross eyed to see it. Well, I am not a computer so I can’t produce one of those, but I did come up with an idea that I hoped was going to create that effect. 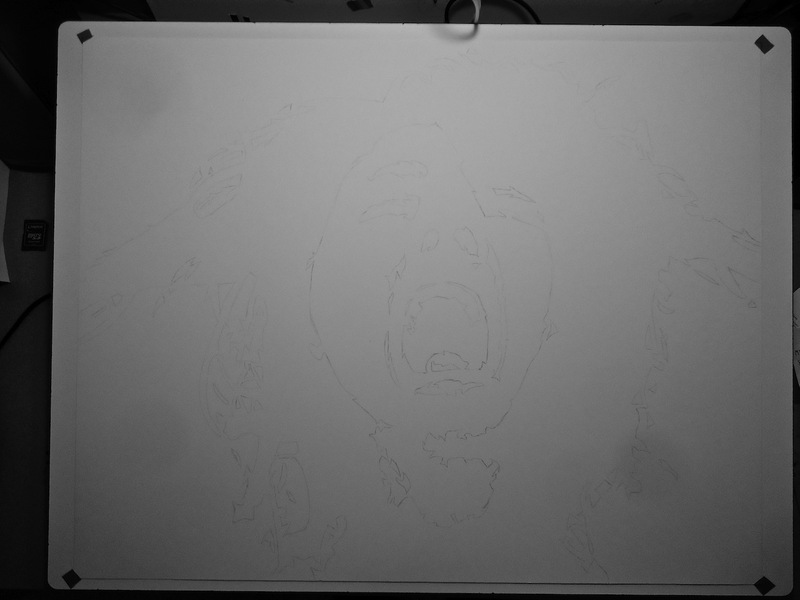 I started off sketching out a woman screaming (and kind of pulling her hair out), which is shown below. I had to play with the contrast a bunch on this, as the pencil lines are extremely light so I could erase them later on. But hopefully you can see the image of this woman. Take a good look at that! After that, I knew I wanted this piece in black and white only. 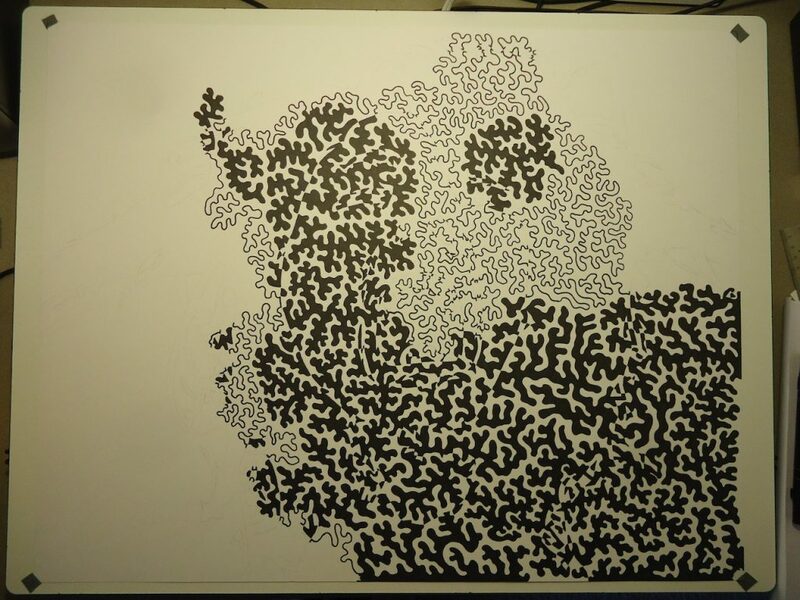 The idea became this – Draw a squiggly line, and once it connects back to itself (or hits an edge) color in the squiggled area with black. However, if you hit a pencil line and cross that barrier, it flips and becomes a white area (and you would color the opposite part in black). Confusing? It sure took me a while to wrap my brain around it, but in the end I developed a system that kept things consistent, even as I was crossing over barrier after barrier, and going deeper into and out of the pencil lines. Here is a snapshot of what it looked like about maybe halfway through. At this point, I have the whole face covered up, but not all the way colored in. I drew it, so I can see the hairline on the bottom right (it just kind of looks funny), but otherwise you can see the right side of her mouth, her right eye, and right eyebrow. To to find the tips where the black touches rather than the squiggles. 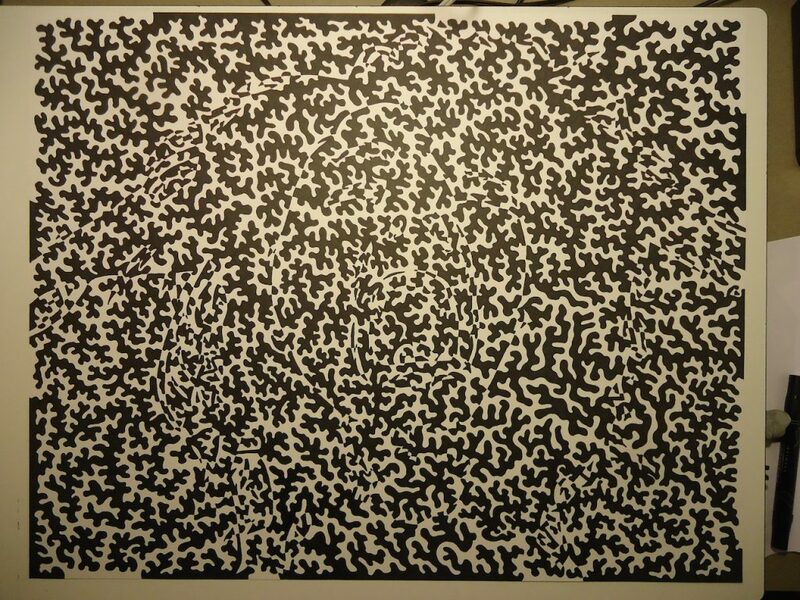 The whole point of this was to be a distraction to your eyes, you get so focused on the squiggly lines everywhere that you minds plays tricks on you when you think there is something deeper within. The final product “Binary Fracture” looks like this. Everyone I have talked to and shown this to, says it is really hard to see when it is small, and I agree. The bigger the image is, the easier it is to see, so try to click on the image (or zoom in) to see if you can still see the woman’s face like in picture one above. It is all still there! This took me probably a solid 3 weeks, all the while listening to Pandora’s Phutureprimitive Radio and Pretty Lights Radio. I think I am going to do another one of these but in color as my next project. It will be twice as much coloring but I think will generate a really cool effect!